This is a first in a series of first-hand accounts of visits to the dark, underworld of the “bad burger,” wherein I present cautionary tales on what can go wrong with our beloved food in hopes that you don’t make the same mistakes I did. 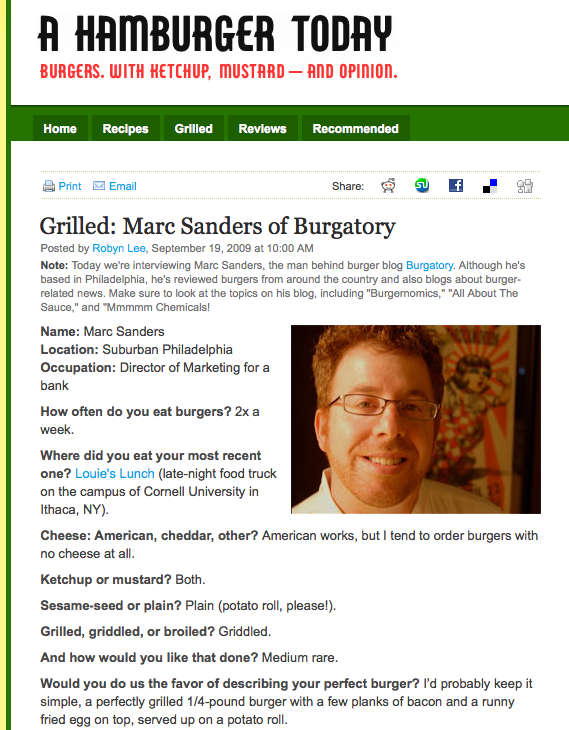 First off, a bit of disclosure – I am not a Burger King guy. I never understood the mystique of flame broiling, never accepted the second-rate product naming standards (Whopper? Whaler?) and until his recent image refreshing, never accepted “The King” as the viable head of a multi-national fast food empire. I grew up on McDonald’s (when on the rare occasion we did eat fast-food) and therefore a grilled burger just tastes better (and if the recent hamburger resurgence over the past few years is any indication – is the preferred method of most burger pundits). I was curious about the new BK Steakhouse Burger. Quite frankly, it looks delicious. And, aside from the burger, it was. If I were a vegetarian, I could live on these (sans the burger)…in fact, it might even be worth trying it with the Boca Vegetarian Burger option that BK offers because the toppings (crispy onions, american cheese, lettuce, tomatoes – really nice red ones!, mayo and A1) and composition of this sandwich are great – it is just the meat that is a let down. The “Angus Burger” feels somehow synthetic (ok, I read Fast Food Nation, too , so I know it truly is synthetic), so maybe unatural is a better descriptor. The patty is huge (normally a plus), spilling over the sides of the already oversized bun, but it has a floppy quality too it and a remarkable ability to hold together as one unit despite its overwhelming size x girth ratio. To the palate it feels spongy, kind of like eating one of those old mousepads…just not appetizing, and the flavor just feels chemically. Kudos for the concept of a burger made with Angus Beef though. This attempt to upscale the selection is a step in the right direction and probably a great business strategy in a world where most people are happy to order the 99 cent double cheeseburger options that now populate most menus. Toss on a little something classy at a few bucks more and I am certain you will get people to “treat” themselves every now and again (if the quality follows). I will give BK credit, the burger I was served is not too different from the one in their marketing materials (see the Checkers Philly Cheese Steak Burger debacle earlier in this blog’s history). Overall a downer. 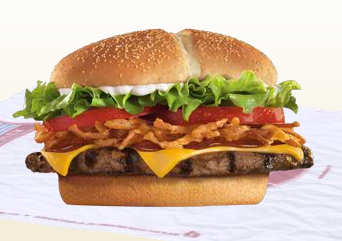 Not sure if it was my BK bias or just a concept gone wrong, but I think I am one and done with the Steakhouse Burger (even though I now understand they have a “loaded” variety with that magical ingredient that makes everything better – bacon) and BK for a long while. First of all, really too bad you don’t enjoy the flame-cooked taste! I love to barbecue burgers-they are sooooo much better than pan-fried!! Even hot dogs taste much better when cooked over flame than boiled. 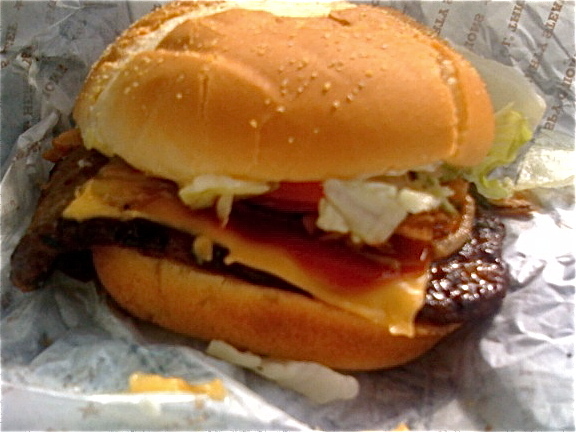 Second, I just had my first BK Steakhouse Burger a few days ago, and it was the best burger I’ve had in a long time! I did get jalapeños added to it, but didn’t even notice the A-1 Steak Sauce, but maybe that’s what added so much flavor. It just had a good, flame-cooked taste to it. When I was a kid in 6th grade my grandpa took me to BK and, after being used to McD’s, I was totally baffled by the names. Wasn’t until many years later that I really noticed the difference between tasteless grilled burgers and flame-cooked. As for the names, many chains have unique item names-remember the Papa, Mama & Baby burgers at A&W? I used to love Big-Macs, back when they were larger than a silver dollar. Still like McD’s cheeseburgers for some reason.